Thank you to Jain for planning a Cinco de Mayo dinner on the Darling Bakers. 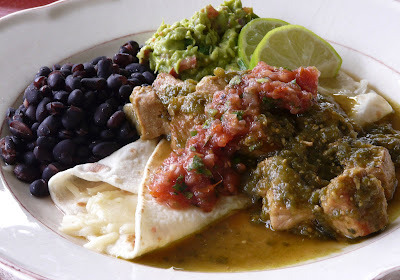 I made Pork Chile Verde with homemade flour tortillas, black beans, guacamole and homemade salsa. Heat oil in heavy pot. Toss pork with flour, and brown. When all the meat has been browned, add the onions and garlic and saute for a few minutes. Add the cumin, the chili peppers, and the tomatillo sauce. Add some chicken broth. Simmer until meat is tender. Sprinkle with cilantro. Serve with flour or corn tortillas and sides of beans, guacamole, salsa, cheese,etc..
stand for 2 hours. Serve at room temperature. Combined wine, syrup, brandy and orange juice and stir. Add sliced fruit and just before serving add the soda water. Do not let the fruit slices sit in the Sangria for more than one hour before serving as the peels can cause the drink to be bitter. Bring water and sugar to a boil and simmer until liquid is clear and the sugar has dissolved. Pour in to jar and refrigerate. Keep for 3 weeks. Your pictures are DELISH! We can't eat a lot of spicy foods here, but I would certainly LOVE a nice bite of everything. It all sounds soooo good. And I think I see sangria in our future this summer! Any excuse to eat Mexcian food is a good one in my book. Happy Cinco de Mayo! We had pork chile verde too! Yours looks delicious. This meal is "Shovel Ready"! Yum! The Sangria looks perfect with it. I just saw it on Tastespotting. Cheers! 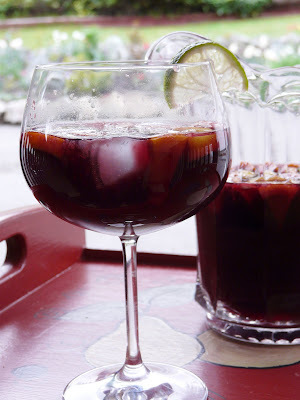 I absolutely love your Sangria recipe; i've been using it for the past 6 years since Matt was kind enough to request it for me. the Chili Verde looks lovely, i'll have to try your recipe.. my last one made with fresh tomatillos ended up being a bit too tart for my liking. Qué delicioso. Ann, I've tried your Sangría, but I'll have to seriously make that Puerco con Chile Verde.